Clermont Chain of Lakes Foundation – Preserving our access and promoting responsible management of our lakes. Together we can preserve and enjoy our lakes! Want in on the next event? join our mailing list or Follow our Facebook page. It’s probably safe to say that everyone is waiting now for signs of progress at the “Bell Ceramics” site at the bottom of East Ave that will be our future boat ramp. While no shovel has yet gone into the ground, many hours of preparation in design and applications for permits have been invested already. Community representatives including CCoLF board members have been involved in design decisions throughout. The new Boating Center will provide many of the things citizens hoped for: more parking, more ramps, better traffic flow for loading & launching, restrooms, and the possibility of additional amenities. Current buzz is that the boat ramp construction may begin soon and could be complete in 2019. Stay tuned for updates. 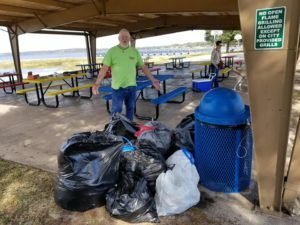 At our “Three Bridges Lake Cleanup” on Saturday, Jan. 19, 2019 a dozen hardy volunteers came out on a beautiful winter day and harvested 10 large bags of trash from Lakes Minneola, Hiawatha, Crystal and from the river and canals. The “most unusual” find was a large gas tank. You just never know. Missed the cleanup? No worries, the next one is our Earth Day Cleanup on Saturday, April 20. You can register to join our team and we’ll share our glory with you, plus give you a Lake Life bumper sticker for helping out. Can’t make it? We’ll let you know about the next event. Please stay in touch by joining our mailing list or our Facebook page. Oh and er… yes, we’re asking directly for your donation to our cause. We intend to keep fighting for YOU, your right to use the lakes, boat with your family and enjoy Lake County’s beauty forever. But the work isn’t free. Please contribute what you can.